When comparing prices on undercut saw rentals in San Jose, Campbell and Santa Cruz, ask about sales tax and environmental fees. Crain's most powerful and versatile undercut saw ever! 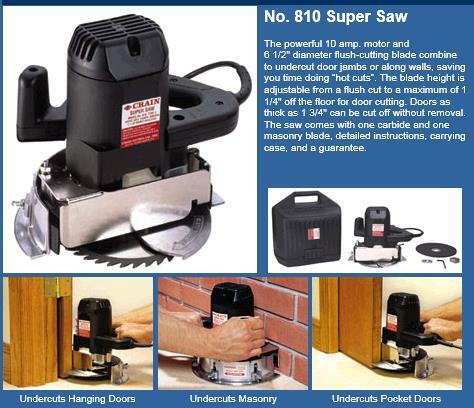 The large 6 1/2" Carbide-Tipped Blade can fully undercut most doors in place. The jamb saw undercuts walls, jambs, corners, and even most toe-spaces. 8.15 amp motor. Cutting dept inward 1-3/4" in 1/8" increments, Cutting distance from floor adjustable up 1-1/4". * Please call us for any questions on our undercut saw rentals in San Jose, Campbell, Salinas, Santa Cruz, Watsonville, Morgan Hill, Hollister, Santa Clara, Gilroy, Milpitas Sunnyvale, Fremont, Salinas, the Greater Bay Area and the Monterey Peninsula.